Over time, society has increasingly expected instant gratification and uses of an “easy” button to achieve a desired result. 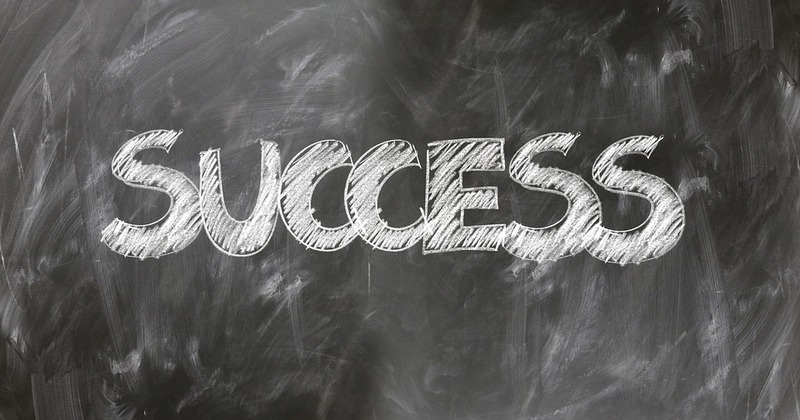 Unfortunately, when it comes to the pursuit of career success, it’s not near that easy. A lot of time and effort is usually involved. I’m sure you have a story about a 25 year old that is already a multi-millionaire and that’s great. Maybe it was pure luck but maybe there was more to it. The purpose of this article is to give you a framework for visualizing the key ingredients to long-term, personal career success, however you define that term. It’s clear from the suggested relative weightings above that I place significance on drive and determination. Otherwise referred to as “fire in the belly”. It’s amazing how far that can get you if it’s genuine. What do you do when a door is slammed in your face or someone tells you “no”? What if those things happen numerous times rather than just once or twice? Do you lose interest and give up or do you keep charging forward? How do you get drive and determination? Well, for many it comes easiest when there is genuine and personal passion for the thing that’s being worked on. That “thing” could be a problem you’re product solves or a significant benefit it provides. Another tool to try is positive reinforcement using phrases you say to yourself from time to time, perhaps 10 times each night before you go to sleep or in the morning when you wake up. You’d be amazed how effective a phrase like “I will do whatever is necessary to reach my goal” is. What are you willing to sacrifice for long-term career success? It usually comes at some cost (trade-offs), so I’m not suggesting it’s for everyone. Let’s talk about intelligence versus common sense, otherwise referred to as “book smart” versus “street smart”. I strongly believe that 1) they are different things 2) they are equally valuable 3) extra strength in one can help offset a weakness in the other. Having said this, being strong in both is a HUGE advantage. An issue to realize is that intelligence can be improved with effort but common sense is mostly ingrained. Common sense can gradually be enhanced over time but it comes from a collection of life experiences, both personal and business. Think about the way wisdom is gained over time. Regarding luck, I don’t want to just flip it out there as some ethereal thing that you have no control over. In fact, 1st century Roman philosopher Seneca, American President Abraham Lincoln and others are credited with saying that “luck is what happens when preparation meets opportunity”. So if you want to influence the 10% I attribute to luck, then engage in “preparation”, which essentially means planning. Do you have goals? Have you written them down or communicated them to others? Have you come up with a plan to achieve your goals and put those plans into some sort of roadmap or phases? That’s what “preparation” means. Someone with strong drive/determination and intelligence, moderate common sense (half credit), and decent preparation (half credit for luck) has 85% chance of career success. Someone that only has strong intelligence, moderate common sense (half credit) and decent preparation (half credit for luck) only has 35% chance of career success. I realize that life isn’t as analytical as this. I also realize that it’s extremely hard for people to accurately judge and measure themselves. But this is actually a suggested thinking and reflection activity rather than an analytical one. I don’t know what career success means to any particular individual but I do feel strongly that these basic guideposts can be used for all that aspire to achieve it. I also think the results come over time and after some level of consistency in the things mentioned in this article. Evaluating short windows of time against a career success yardstick might show various ups and downs but the trend towards career success should be positive. I hope this article gives you a framework to think about and plan for achieving your own career success or helping a friend or loved one do the same. So you’re a college graduate that just secured a full-time job and now more money is rolling in than you’ve ever been responsible for. You’ve heard horror stories about how new-found financial freedom can suddenly turn into a nightmare with just a couple of wrong decisions. This blog post doesn’t cover obvious problems like driving up credit card debt but instead describes some fundamental principles to guide you. Warning: I am not a certified financial advisor/planner. I’m just a guy that has done well with my own personal investments and has had the benefit of passing advice to two daughters when they graduated from college and got their first job. 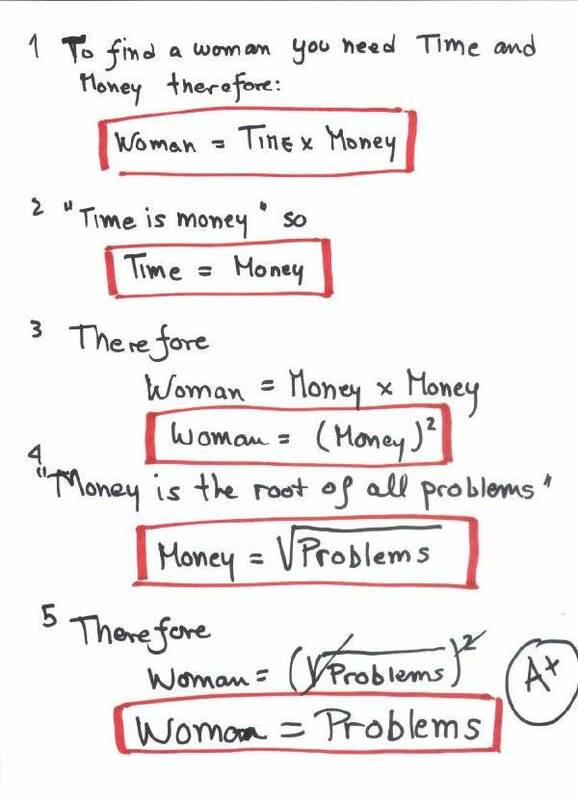 You have to be able to remember basic algebra to appreciate this mathematical formula that explains women. Click the graphic to expand. I’m sure there is an equivalent for men and if I find it I’ll post it as well. Sorry but no rocket science here. Mostly common sense, but I can virtually guarantee that following these 7 basic steps will make a huge difference in your grades during college. I can’t promise a 4.0 GPA but am willing to bet that systematically following these basic principles will add at least a single grade point to your freshman year average versus the typical student. After a couple of years, most college students naturally figure these things out as they develop and refine their own personal system. But during your freshman year everything is so new, exciting and DISTRACTING. 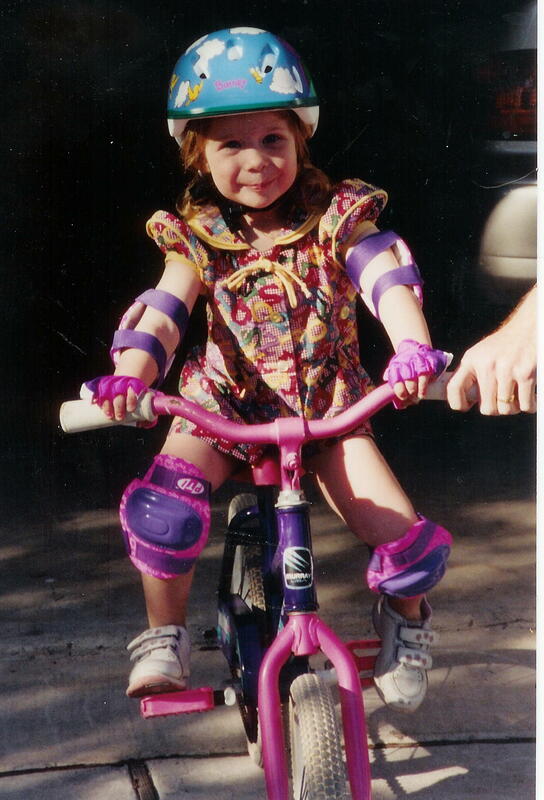 Author Gordon DaughertyPosted on September 30, 2012 September 30, 2012 Categories General, ParentingTags bike riding instruction, riding a bikeLeave a comment on Teaching Your Kid to Ride a Bike – Could It Be This Simple?